Learn how to cook a country fried chicken recipe for dinner. Although the South wants to claim the fame for country fried chicken, this is the only way Mom made fried chicken in Ohio. The chicken was always slowly fried until very tender and the flavor was “fabulous”! Mom always used an old cast iron skillet to cook the chicken. Even better than having Mom’s country fried chicken recipe was eating her delicious thick creamy chicken gravy. 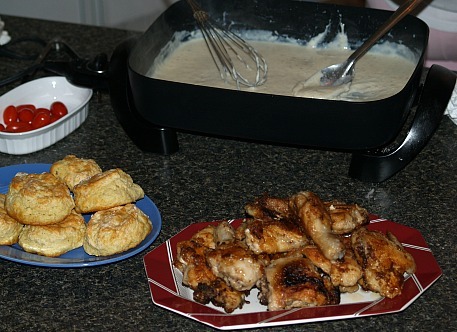 Quite often we had Mom’s chicken and gravy with hot biscuits for a hearty breakfast and it was sooooo good. The people here throughout the South tell me that the name “Sawmill gravy” came from the back hills of Kentucky and Tennessee. The sawmill crews often survived on eating biscuits, gravy and coffee. The biscuits and gravy dish was called “poor-do” meaning the poor made do with this meal of biscuits and gravy. Combine flour, salt and pepper in a large bowl. 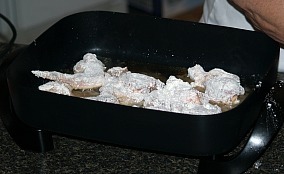 Roll pieces of chicken in flour mixture and place in hot skillet; brown on both sides. Reduce the heat to medium low and cover with a tight fitting lid. Cook slowly until the chicken is very tender. Over medium high heat stir flour into chicken drippings left in skillet. 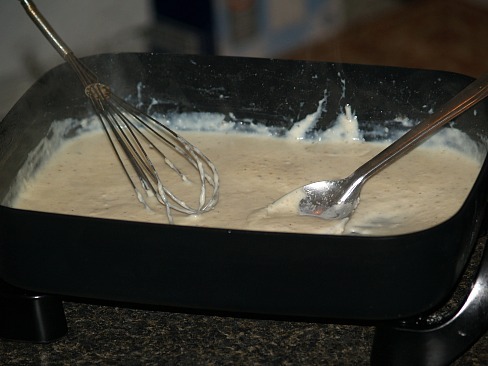 Gradually whisk in the milk and cook until creamy and thick. Season to taste with salt and pepper; serve hot over mashed potatoes or biscuits. 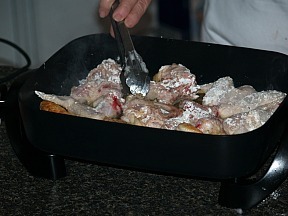 Dip each piece of chicken into buttermilk and then coat with seasoned flour; set aside. 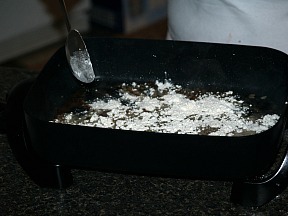 Put lard and butter in a heavy skillet and place on a hot burner; heat until near smoking. Quickly arrange pieces of chicken in hot skillet and carefully brown on both sides. Reduce the heat and cover tightly with a lid. Fry about 20 minutes or until the chicken is thoroughly cooked and tender. Learn how to cook country fried chicken recipe with a crispier crust. Combine egg, milk, 1 teaspoon black pepper and sugar in a bowl. In another bowl or paper bag, combine flour, cornmeal, cereal, baking powder, salt and onion powder. Dip each piece of chicken in the egg mixture then the dry mixture. Place on a cookie sheet covered with wax paper; refrigerate about 20 minutes. Cook chicken in hot oil (deep fried or in a skillet) until golden brown and thoroughly done. NOTE: If you like extra crispy, after cooking place on a cookie sheet in the oven at 450F degrees for 5 to 8 minutes. SUNDAY DINNER CHICKEN This Sunday dinner country fried chicken recipe is flavored with thyme and a hint of lemon. Combine flour, salt, thyme and paprika in a plastic bag and shake to blend. In a large bowl combine eggs, milk and lemon juice; stir well. 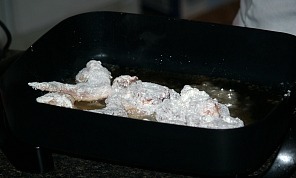 Place 2 or 3 pieces of chicken in the bag with flour mixture and shake to coat. Dip chicken in the egg mixture then back into the bag; shake to cover. Repeat process until all chicken is coated. Pour oil to a depth of ¾ inch in a large heavy skillet. 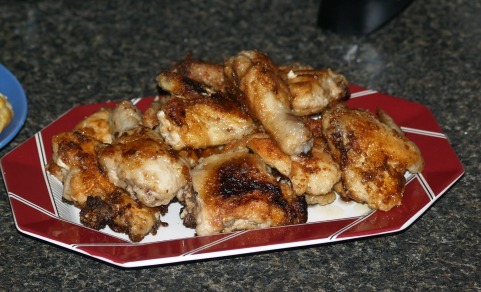 Fry a few pieces of chicken at a time in the hot oil over medium heat until golden brown. Turn chicken over to brown on both sides; drain on paper towels. Repeat process until all chicken is thoroughly cooked. Here is a delicious buttermilk biscuit recipe that many Southern cooks prepare to accompany delicious country fried chicken recipes. Sift together flour, baking powder, salt and baking soda in a large bowl. Cut the butter into the flour mixture until crumbly. Add buttermilk to the mixture tossing with a fork until dough forms. 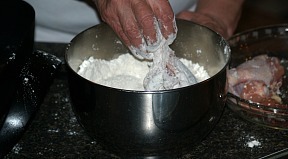 Turn dough out onto a lightly floured surface; knead lightly until smooth. Roll dough out to ¾ inch thickness and cut with biscuit cutter. 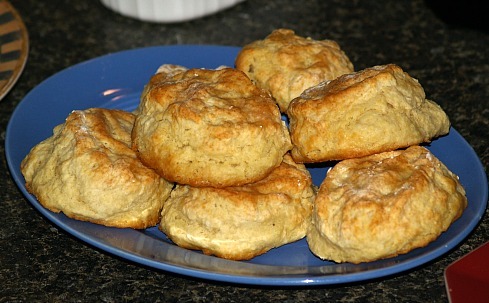 Place biscuits on a lightly greased baking sheet. Bake in oven at 400F degrees until golden brown; about 15 minutes. In a large bowl combine milk and 1 tablespoon Cajun seasoning. Add chicken to the milk mixture, cover and refrigerate for at least 2 hours. In a large zip lock plastic bag combine flour, lemon pepper, garlic and 1 tablespoon Cajun seasoning. 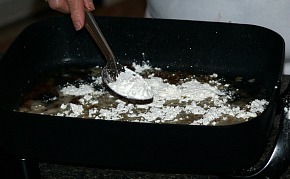 Drain chicken and discard milk mixture; place chicken in flour and shake to coat. Heat ¼ inch of oil in a large skillet; fry chicken turning once 7-8 minutes until done.